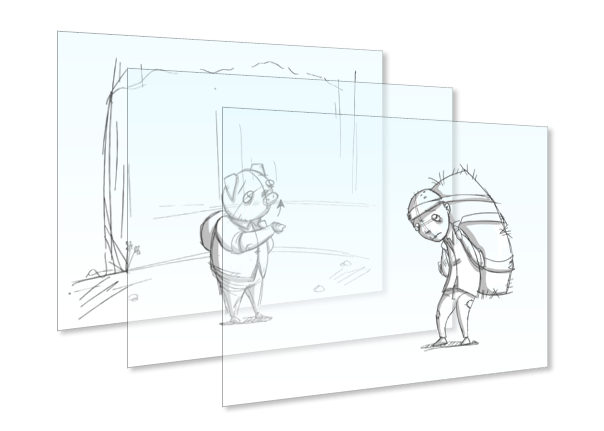 Storyboard Pro allows you to work with layers. Each panel in your project has its own list of layers, each of which can contain a separate drawing. Composed together, the layers make the drawing that appears in your panel. Working with layers allows you to keep separate elements in your panels, such as backgrounds, characters and props, into separate drawing spaces, as well as to manipulate or animate them if needed. When you create a new project, or add a new scene or panel to your project, the panel will always have two layers by default: A character or prop layer (A) and a background layer (BG). You can add as many layers as you need to a panel, and you can also rename, reorder and delete layers. Once your layer list is set up for your panel, you can start drawing on each layers. To draw on a specific layer, simply select this layer in the Layer panel, the Thumbnails view or the Layers view. When you use a drawing tool in the Stage view, the artwork you create or edit is always the one in the currently selected layer. Hence, you must always mind which layer is selected when drawing or editing your artwork. A layer in a panel can be copied into your library then added to another panel. Hence, drawing your scene elements on multiple layers can allow you to reuse drawings when a later panel or scene features the same element.